The range of miticides available ‘off the shelf‘ to UK beekeepers has recently been increased by the introduction of Apitraz and Apivar. ‘Off the shelf’ because, until recently, these were only available with a veterinary prescription. Considering the extensive coverage on this site of oxalic acid-containing miticides and more recent posts about the – regularly ineffective – Apistan, it seemed fair and appropriate to write something on the active ingredient and mode of action of these new products. Conveniently, because the active ingredient is identical, these can be dealt with together in a single post. The similarities don’t end there. The amount of the active ingredient is the same and the way it is administered is very similar. They are different commercial products; Apitraz is distributed by Laboratorios Calier, SA and sold by BS Honeybees, Amitraz is distributed by Veto Pharma and sold by Thorne’s. The strips have a different appearance and a slightly different mechanism by which they are hung in the hive. 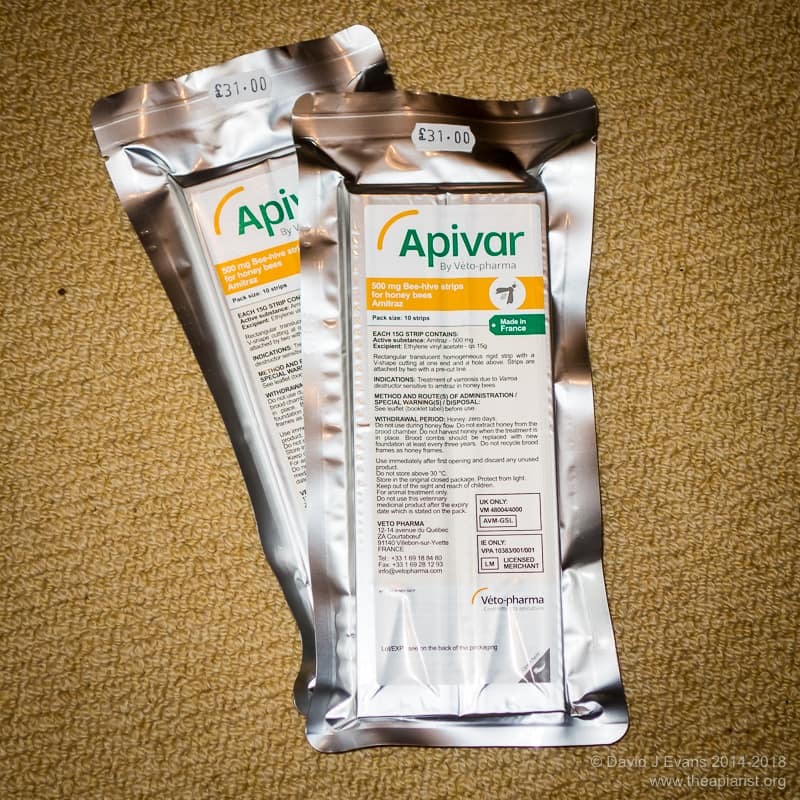 They even cost about the same – a single packet of 10 strips (sufficient to treat 5 hives) costs £30.50 and £31 respectively for Apitraz and Apivar. The active ingredient in both Apitraz and Apivar is Amitraz. Amitraz is a synthetic acaricide – a pesticide that kills mites and ticks. It was discovered and developed almost 50 years ago by the Boots Co. (the drug development predecessor of the Boots the Chemist 1 found in most high streets). Amitraz is the active ingredient in a range of medicines approved by the Veterinary Medicine Directorate, including Aludex and Certifect, both of which are used to treat mange in dogs. For completeness I should add that Amitraz used to be used by US beekeepers and was sold as a generic pesticide under the name Taktic, though this was withdrawn in about 2014. I believe that Apivar is now available as a slow-release Amitraz-containing Varroa treatment in the US. Amitraz has to be metabolised (essentially ‘modified’) before it is active. This modification occurs much less well in bees than in mites. In fact, the toxicity of Amitraz for bees has been determined to be about 7000 times less than in mites. Once converted into an ‘active’ form the most important mechanism of action for Amitraz is through interaction with the alpha-adrenoreceptor and octopamine receptors of Varroa 2. OK, since you asked … octopamine receptors normally bind a neurotransmitter called – rather unimaginatively – octopamine. Quelle surprise as an apiculteur would say. It’s likely that occupancy of these receptors by Amitraz triggers a series of so-called downstream events that change the behaviour of Varroa. Similarly, amitraz also acts as an agonist 3 when binding to the alpha-adrenoreceptor which normally interacts with catecholamines. This results in neurotoxicity and preconvulsant effects. That all sounds a bit vague. Essentially, amitraz binds and activates receptors that are critically important in a range of important aspects of the Varroa activity and behaviour. Remember here that the mite is entirely dependent upon proper interaction with the bee to complete the life cycle. For example, if the mite fails to enter a cell at the correct time or doesn’t hitch a ride on a passing nurse bee for a few days, it will likely perish. Amitraz changes behaviour and so exhibits miticidal activity. It has additional activities as well … these multiple routes of action may explain why resistance to amitraz is slow to develop. More on this later. Both Apitraz and Apivar are formulated as plastic strips impregnated with amitraz. The bees must come into contact with the strips to transmit the amitraz around the hive. Two strips are therefore placed between frames approximately one-third of the way in from each side of the brood box – typically between frames 4 & 5 and 7 & 8 of an 11 frame box. This assumes the bees occupy the entire box. If they don’t, arrange the strips in the appropriate part of the box with 2 frames separating them. Both types of amitraz-containing strips have a means of securing them hanging between the frames. The recommended treatment period is 6 (Apitraz, or Apivar with little/brood present) to 10 weeks (Apivar with brood present). As with Apistan, treatment should not be applied during a honey flow or when honey supers are present. Further details are included on the comprehensive instructions provided with both products. There’s also a reasonable amount of information on this New Zealand website for Apivar. This is the good bit … very, very effective. 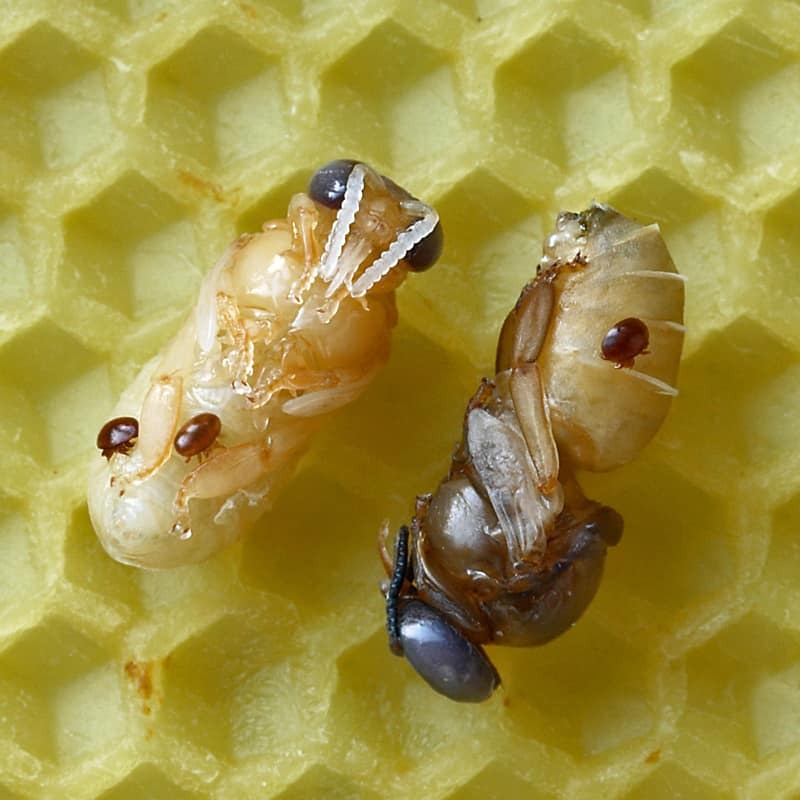 When used properly, amitraz-containing miticides can kill up to 99% of the Varroa in a colony. The good news first. Amitraz does not accumulate in wax to any significant extent. It is not wax-soluble. This is in contrast to Apistan which is found as a contaminant in most commercially-available beeswax foundation. And now the bad news. Beekeepers also have alpha-adrenoreceptors and octopamine receptors. So do dogs and fish and bees. Although amitraz has increased specificity for the receptors in mites and ticks, it can also interact with the receptors in other organisms. Consequently, amitraz can be toxic. In fact, if you ingest enough it can be very toxic. Symptoms of amitraz intoxication include CNS depression, respiratory failure, miosis, hypothermia, hyperglycemia, loss of consciousness, vomiting and bradycardia. And it can kill you. Admittedly, the doses required to achieve this are large, but it’s worth being aware of what you’re dealing with. Amitraz-containing strips should be used only as described in the instructions for use, handled with gloves and discarded responsibly after use. Multiple modes of action makes it much more difficult for resistance to evolve. But it can and does. Resistance to amitraz is well-documented and is understood at the molecular level. However, this is in cattle ticks, not Varroa. At least, not yet, though there are numerous anecdotal reports of Varroa resistance. I’ll deal with resistance in a separate post. It’s an important subject and avoiding it is a priority if amitraz-containing compounds are going to remain effective for Varroa control. At about £6 per colony, amitraz-containing treatments are not significantly more expensive than the majority of other approved miticides, perhaps with the exception of Api-Bioxal which is appreciably less expensive (though more restricted in the ways it can effectively be administered 4). When you purchase a couple of packets of Apivar – enough for 10 colonies – it might feel expensive 5. However, it’s worth remembering that this is still less than the likely ‘profit’ on a couple of jars of your fabulous local honey per colony per year, which seems pretty reasonable in the overall scheme of things. Now, more correctly, Boots UK. To be pedantic this hasn’t been formally demonstrated, but is inferred from the known mode of action – and acquisition of resistance – of Amitraz against other types of mites and ticks. I’m excluding ‘neat’ oxalic acid from this comparison as it is not – and never has been – a VMD-approved treatment … thought it remains both effective and very inexpensive. What do I mean might? Shelling out over £60 for two thin foil-wrapped packets of the stuff does feel expensive! This entry was posted in Beekeeping, Economics, Varroa control and tagged amitraz, Apitraz, Apivar, Taktic, VMD approved on March 9, 2018 by David. Thanks David, at long last a clear and very informative description of the way amitraz works. I look forward to the next installments. I can’t remember whether you’ve produced/replicated/signposted a table showing all available varroa treatments and their relative efficiency. I’ve never used amitraz but I’m nearly convinced I should try it. I’ve only got poly hives; any problem using amitraz in those? No problems with poly hives Hans. I’ve not produced a real side by side comparison, other than by price. All of the major VMD licensed ones are – under optimal conditions and used properly – able to give 90-95% or greater reduction in mite numbers. I think beekeepers need to choose the most appropriate treatment for the time of the season, the state of the colony etc.. Thanks for explaining how these work. 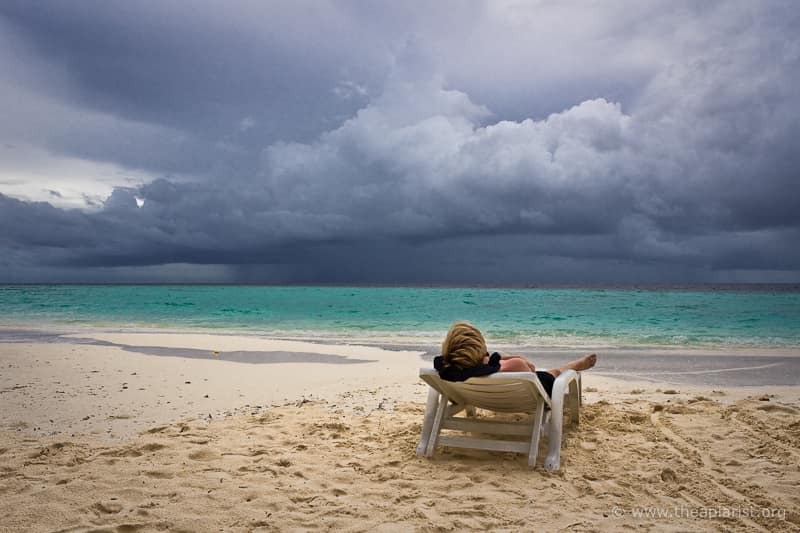 I’m used to using Apiguard in late summer and oxalic acid in the winter. Could these be used instead of Apiguard? The treatment period is a bit longer than Apiguard but it sounds like they’re slightly more effective. Yes, this is an alternate to Apiguard with its own pros and cons … it can be used at lower temperatures for example. However, unlike Apiguard (thymol-based) Amitraz is a ‘hard chemical’ so may not be acceptable to some beekeepers. Since it’s only come off prescription in the last few months I’ve not used it on my personal colonies (but I have bought some now). I have used it on research colonies and seen that it can be spectacularly effective in reducing high mite levels. It’s popular up here in Scotland as it can be used in our cool late Septembers after bringing bees back from the heather (though this might be sub-optimal in terms of protecting winter bees from Varroa-transmitted viruses). Why was Taktik removed from sale in the USA in 2014? Taktic was voluntarily withdrawn by the manufacturers in the US … it wasn’t a bee-specific pesticide, but beekeepers used it. They now have Apivar. If you search Beesource you’ll find threads with recipes for use of Taktic have been edited by the moderators. I’ve corrected the original text to clarify the current position. Anecdotal reports by many beekeepers in East Anglia are that mite drops this year both before and following treatment have been extremely low. There is also a “stop treating” movement. I must say, if mite fall is low, it seems a pity to spend the money on treatments – except I’ve already bought the stuff so might as well use it before it goes over age. I’ve heard mixed reports. Mite drop after treatment in my own colonies has been very low which I ascribe to mid-season splits and – possibly – the excellent season (though I’m not sure how this reduces mite levels, but it’s one thing that’s been very different in 2018). However, I know many beekeepers who have very high mite levels this year. There’s always a proportion of beekeepers promoting “no treatment” or “treatment free” … I don’t doubt it’s manageable for a while with excellent beekeeping, timely splits and whatever else accounts for low mite levels this season. However, in the longer run I don’t think it’s achievable – at least not without excessive colony losses or generally poor colony health – with the density of bees across most of the UK. I’m pretty certain I couldn’t manage without treating and am not willing to jeopardise the health of my colonies to try. Finally, in East Anglia you’ll have brood rearing for a few weeks yet so there’s still ample opportunity for the low mite levels to build up. Mite drop before treatment was very low; For my own 12 colonies, only one produced the expected drop. I was speaking to a former Regional Bee Inspector today; he now has only 3 colonies & told me he had no drop from any of them over a week. Colony management through the summer was as usual – most started queen cells so were split but not all. Just wanting to make sure I follow what is being said. When the term ‘mite drop’ is used just what is the meaning? A decrease in the level of mites in the hive or dead mites dropping to the bottom of the hive where they can be counted? In my case I really have no idea what my mite load is. I did a sugar roll on one hive and it did turn up one mite but probably had less than the prescribed 1/2 cup of bees to sugar. I do plan to treat my hives in the next few days and will try to see what appears in the bottom of the hive. In the context it’s used on the page here ‘mite drop’ refers to the number of dead mites that appear on the bottom board or Varroa tray underneath an open mesh floor. It indicates that the miticide used is working. However, it doesn’t necessarily mean it’s working really well. If the mite load in the hive (i.e. the total number of mites in the hive) is 2000 and you get a 99% kill you’ll get over 1900 mites on the floor of the hive after treatment (this assumes all the mites are phoretic and killed by the treatment). If you get only 500, but have no idea of the total number of mites in the hive, it could look as though the treatment is working well, but actually it’s only 25% effective. I’m not sure where you are located (Texas possibly from your IP) but it’s worth remembering that the timing of the end of season treatment is important to protect your winter bees. A little advice please, if you have the time? As a newbie (since 01.07.18) I will and have made mistakes! I don’t want to open them up as when I tried 2 weeks ago without smoke, but fully suited , understandably I was attacked! Do you know if the stuff will have been propolised by now? Will it have lost its efficacy anyway by now? Will it kill my bees if I leave them alone until Spring? I’m not sure where you are located but it’s highly likely there are Apistan-resistant mites in your region. Leaving strips present with an increasingly ‘weak’ level of the active ingredient will do your bees no harm whatsoever. However, it will benefit the mites. Any that are already resistant will be unaffected and those that are not might have an opportunity to replicate a bit more in the reduced level of tau-fluvalinate (the chemical that normally should kill them). I’d plan to do a midwinter dribble with an oxalic acid-containing compound to hammer any residual mite levels down. At the same time, use the opportunity to remove the strips. Oops, sorry its Apistan that I have left behind! Now I’m confused … perhaps you meant Apivar the first time? Whichever it is leaving them in overwinter is specifically advised against in the instructions (because of the likelihood of it leading to resistance). Do the OA dribble and remove the strips then. Remember also that Apistan residues accumulate in comb – another great way to help select for resistant mites. Will source the gear for OA and follow the instructions / watch the videos.